Piggy-backing off of my good friend, Kasey Hutchinson’s expert nutrition advice, I thought I’d focus on how summer is around the corner and temperatures are getting hot, so what should you eat and drink on your athletic adventure? It is important to eat and drink properly throughout the day while exercising in the heat because if you don’t, your muscle strength could decrease while you’re at the crux of a sport climb. It takes a fluid loss of three percent body weight to decrease muscle strength. It only takes two percent body weight of fluid losses from dehydration to impair exercises like trail running. For an athlete weighing 200 lbs, two percent body weight would be 4 lbs or two liters of fluid losses. Typical Nalgene bottles are one liter each, so think about loosing two Nalgene bottles of fluid through sweat and other bodily functions. You need to replace those losses, and then drink a cup or more of fluid to stay hydrated! If the hot weather is also windy, humid, or dry, water and electrolyte needs are increased even more. Electrolytes such as salt (sodium chloride) as well as potassium, magnesium and calcium in lesser amounts are what you loose in your sweat. Sweat helps us to cool our body down when it’s hot out. Some athletes are salty sweaters or sweat more than others. · 0-120 mg Calcium (1/3 cup almonds). Heavy sweaters, especially in hot weather, could loose up to three liters of fluid every hour depending on whether you’re sport climbing, trail running, or mountain biking etc. If 3 L of fluid loss is the case for you, make sure to multiply 1-teaspoon salt, 2 oranges, 1 fig and 1/3-cup almonds by 3 L for every hour you’re out exercising hard in the hot weather. 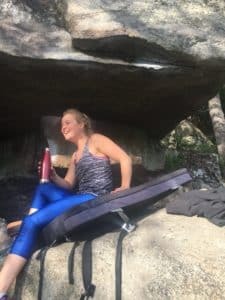 Of course there are other fluid and food sources to mix and match so that you’re not wolfing down a cup of almonds every hour trying to pedal, run, or send a multi-pitch climb. Splashing Gatorade in your water bottle or drinking G2are a couple options as well as making your own rehydration sports drink like salted watermelon juice with some pumpkin seeds and almonds on the side. Let’s say you’re rock climbing or mountain biking in Moab, Utah in June. It’s 98 degrees Fahrenheit, but somehow you don’t feel a drop of sweat on you. Something to keep in mind in the desert or dry heat is that we don’t always notice how much we sweat because it is evaporating so quickly. Compare this to New England humid summers where you might be sweating buckets. In hot weather, our body increases heat loss mostly by sweating. With high humidity, it is harder to rid your body of excess heat through evaporation of sweat. 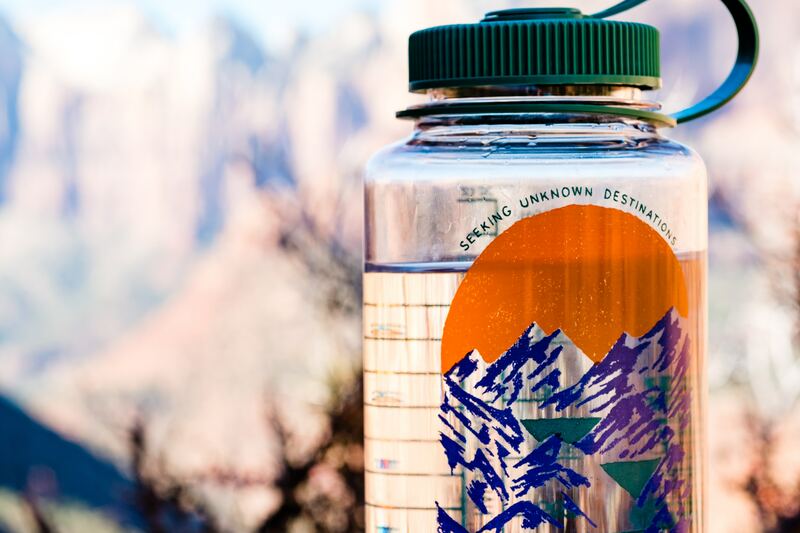 If you’ve been sweating all day in the desert and drink four Nalgene’s of plain water you might notice you have a headache, feel bloated, puffy, and nauseous or if it really gets worse – vomiting, confusion or loss of consciousness could occur. These symptoms are seen when sodium levels drop below 130 mmol/L known as hyponatremia. To avoid hyponatremia and dehydration, consume fluids and food sources that have electrolytes, especially when exercising for longer than one hour. Heat illness is of concern if you feel dizzy, lightheaded, or faint, have a headache, cramps, muscles tighten or spasm, have Goosebumps, become nauseous and vomit. · Adapt to exercising in the heat, which takes seven to fourteen days. · Start with shorter exercises in the heat, and gradually increase exercise time daily. · Begin exercise well hydrated by checking urine color. Urine should be light yellow to nearly clear. · Consume cold, flavorful fluids during and after exercise because they are more desirable to drink. Instead of Nalgene’s, Hydro flasks are awesome re-usable water bottles to keep fluids cold for hours. · Make a ‘mocktail’– Drop in some frozen blueberries with squeezed lemon wedges and slapped mint for a delicious flavor. Make sure you literally slap the mint with your hands so the oils extract! Heat can have an affect on your appetite, so it’s important to still have the right individualized amount of food and fluids before, during, and after your exercise activity. Staying hydrated is a balance of water, electrolytes and carbohydrates. Seek out a Sports Dietitian to individualize your nutrition needs and fitness goals! 1. Hew-Butler T, Rosner MH, Fowkes-Godek S, et al. Statement of the third international exercise-associated hyponatremia consensus development Conference, Carlsbad, California, 2015. Clin J Sports Med. 2015;25(4):303- 320. 2. Jeukendrup AE. Nutrition for endurance sports: marathon, triathlon, and road cycling. J Sports Sci. 2011;29(suppl 1):S91-S99. 5. Sawka Michael N., Burke LM., Eichner ER et al. American College of Sports Medicine position stand. Exercise and fluid replacement. Med Sci Sports Exerc. 2007;39(2):377-390. 6. Sawka, Michael N., Samuel N. Cheuvront, and Robert W. Kenefick. Hypohydration and human performance: impact of environment and physiological mechanisms. Sports Medicine (Auckland, N.z.) 45.Suppl 1 (2015): 51–60. PMC. Web. 13 May 2018. 7. Shirreffs SM, Sawka MN. Fluid and electrolyte needs for training, competition, and recovery. J Sports Sci. 2011;29(Suppl 1):S39-S46.